Purchasing a new Liftmaster garage door opener is simple and straightforward. Visit our showroom if you wish to see and hear these quiet operators in person! 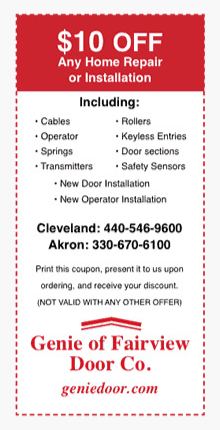 Most of our local customers in Cleveland, Akron and throughout suburban areas of Northeast Ohio will call us to schedule installation of a new Chamberlain or Liftmaster garage door opener. We are happy to schedule those installation appointments at your convenience and a partial payment is requested at that time. Some of our customers prefer to install their own Liftmaster garage door opener. If you decide to purchase a professional grade model from our store and do your own installation, for pick-up purposes please keep in mind that our operators have durable, one-piece rails approximately 10 feet long. All the Liftmaster garage door openers we sell come with deluxe transmitters that feature Intellicode Access Security System with rolling code technology that prevents thieves from entering the garage by duplicating access codes. Click a Liftmaster opener below for more information. Now when the power goes out, your garage door opener still goes up, The stylish LM8550 has a battery backup feature. The patented EverCharge battery backup system is there to power the opener and all of its safety features when you need it most. Always charged and ready, it provides the highest level of safety and convenience imaginable. Plus, it’s possibly the quietest system ever created. The powerful 12V DC motor features a belt drive system that provides ultra-quiet operation, along with smooth start and smooth stop to reduce the noise of the garage door as it opens and closes. Perfect for homes with a room above the garage. The Chamberlain LM8550 offers an integrated battery backup system to reliably lift and close the garage door even when the power goes out. Premium motion-detecting control panel – it sees you coming! Turns garage door opener lights on automatically when you enter a dark garage…hands free! Today’s garages go far beyond a place to merely park your car. So no matter if you want the extra storage space up above, have an oversized garage door, or even a cathedral ceiling, the LiftMaster Model 8500 Residentail Jackshaft Opener is a perfectly engineered solution to fit your specific garage door opener requirements. It mounts easily on the wall beside the garage door, and comes with a remote 200-watt light that can be positioned anywhere in the garage. The optional EverCharge Standy Power System – that continues to operate your opener even when the power goes out – makes it even more convenient. Powerful 24V DC motor provides quiet operation, along with variable speed smooth start and smooth stop. Auto-force feature constantly monitors garage door system and adjusts forces to temperature fluctuations, floor height, and door track movement. The Smart Garage Door Opener lets you electronically program security codes from the Smart Control Panel or the powerhead. ‘Enclosed gear case provides continuous lubrication and protection for longer life and smoother operation. A 6-foot power cord makes connecting to a power source easier than ever. The Protector System safety sensors project an invisible light beam across the garage door opening and automatically reverses the door if anything interrupts the beam while the door is going down. Opener light turns on automatically when The Protector System’s infrared beam is broken. Manual release handle in case power failure.